Holton signed a futures contract with Philadelphia on Tuesday. Analysis: Holton appeared in one game for the Raiders this season, playing 10 snaps and not recording a catch. 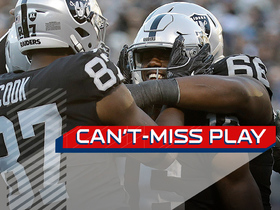 He spent much of the season on Oakland's practice squad and will look to carve out a role as a depth receiver and special teams player on the Eagles' active roster in 2019. Holton re-signed with the Raiders' practice squad Wednesday, Michael Gehlken of the Las Vegas Review-Journal reports. Analysis: Holton was waived Monday to make room for tight end Darren Waller, but now finds his way back to the practice squad. The Cincinnati product was activated ahead of Sunday's loss to the Ravens -- a game in which he logged 10 offensive snaps. In a corresponding move, the Raiders also signed edge defender James Cowser to the practice squad. Holton was waived by the Raiders on Monday, Michael Gehlken of the Las Vegas Review-Journal reports. Analysis: Holton was waived by the Raiders to make room for tight end Darren Waller on the 53-man roster. The 27-year-old was promoted from the practice squad last week, but he has ultimately been cut after playing only 10 offensive snaps during Sunday's loss to the Ravens. If Holton goes unclaimed on waivers, he'll be free to search for a depth role elsewhere in the league. The Raiders signed Holton off their practice squad Wednesday. Holton is taking some reps at the defensive back position Thursday, Scott Bair of NBC Sports Bay Area reports. 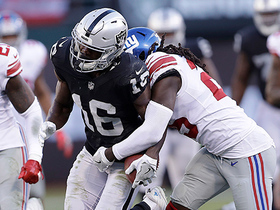 Analysis: Holton's time on the Raiders' practice squad could revolve around a potential transition from wideout to cornerback. The position change makes some sense, given Holton's impressive speed and trouble with drops, but it remains to be seen whether the third-year pro will thrive at the defensive back position. If Holton can offer usage as a depth piece in addition to special teams, it could increase his chances of sticking to a 53-man roster down the road. Holton landed on the Colts' practice squad Tuesday, Michael Gehlken of the Las Vegas Review-Journal reports. Analysis: Holton was waived by the Raiders last week. He went unclaimed and has now found a new home on the Colts' 10-man practice squad. The third-year receiver will now look to make an impression and earn a spot on the 53-man roster if an opportunity opens up. Analysis: In a corresponding move, the Raiders signed veteran Brandon LaFell after he was waived by the Bengals over the weekend. Holton was further down the Raiders' depth chart, but he would have played an important role on special teams due to his coverage abilities. He'll now look to sign to a team or practice squad in need of receiver depth. Holton is facing an uphill battle for a spot on the 53-man roster in Oakland, Matt Kawahara of The San Francisco Chronicle reports. Analysis: Holton suited up for all 16 games last season, catching nine passes for 218 yards and three touchdowns on the year. Despite his speed and deep-threat status, he's struggled with drops and was already near the tail end of the depth chart prior to the offseason acquisition of Jordy Nelson. Look for Holton to battle with Seth Roberts and Ryan Switzer for the depth receiver roles on the Raiders' Week 1 roster. Holton hauled in nine passes (on 18 targets) for 218 yards and three touchdowns in 16 games during his 2017 campaign. 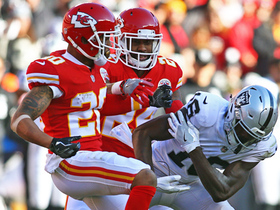 Holton caught two passes on four targets for 18 yards in Sunday's 26-15 loss to the Chiefs. Holton caught three passes for 39 yards and a score on seven targets during Sunday's win over the Giants. Holton was a regular with the first-team offense at Wednesday's practice in the absence of Michael Crabtree (suspension) and Amari Cooper (concussion/ankle), Michael Gehlken of the Las Vegas Review-Journal reports. 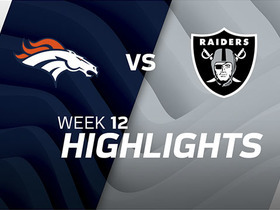 Holton caught two passes on as many targets for 53 yards during Sunday's 21-14 win over the Broncos. Holton (concussion) is active for Sunday's matchup with Denver. Analysis: Holton was held out of practice on Wednesday and Thursday due to his concussion, but a limited practice on Friday opened the door for his availability Sunday. He'll likely see his typical role as a depth receiver and special teams player. 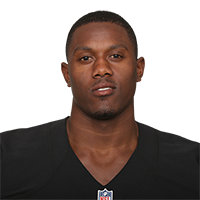 The Raiders have listed Holton (concussion) as questionable for Sunday's tilt against the Broncos. Analysis: Holton returned to practice in limited fashion Friday, but will need to clear concussion protocol in order to see the field Sunday. Regardless, the 26-year-old primarily plays a special teams role with the club, so an absence would not have any real impact on the offense. Holton (concussion) didn't practice Wednesday. Analysis: Holton is presumably under concussion protocol and will need to be cleared by an independent neurologist in order to play Sunday against the Broncos. 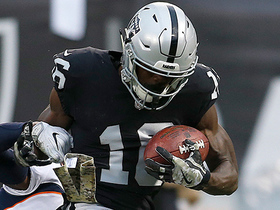 Holton caught his lone target during Sunday's win over the Dolphins, hauling in a 44-yard touchdown pass from Derek Carr. Analysis: Holton's two catches throughout his 2017 campaign have both gone for more than 40 yards and he found the end zone on both occasions as well. His fantasy value remains severely limited, however, as he's played double-digit offensive snaps just twice in nine games. 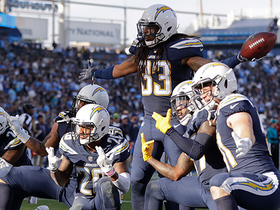 Los Angeles Chargers safety Tre Boston intercepts Oakland Raiders quarterback Derek Carr on a deep pass in the end zone. 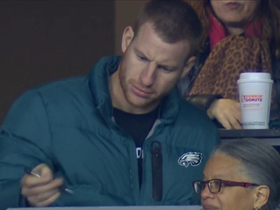 Philadelphia Eagles injured quarterback Carson Wentz takes notes on game from press box at Lincoln Financial Field. Steven Nelson rips ball out of Johnny Holton's hands, Chiefs recover. 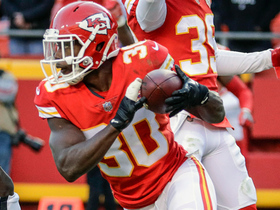 Steven Terrell seals Chiefs victory with inteception. Oakland Raiders wide receiver Johnny Holton defies gravity and toe-taps to set up a touchdown. Oakland Raiders quarterback Derek Carr hits wide receiver Johnny Holton in stride for a 9-yard touchdown. New York Giants cornerback Brandon Dixon rips the ball away from wide receiver Johnny Holton and the Giants recover. 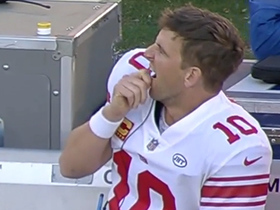 On the sideline, New York Giants quarterback Eli Manning adjusts to being a back-up quarterback. 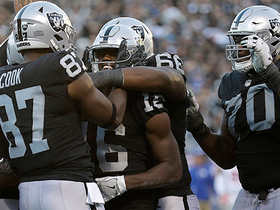 Oakland Raiders wide receiver Johnny Holton storms into No-Fly Zone for 47-yard catch.